When you think of Cowboys you probably think of several things. 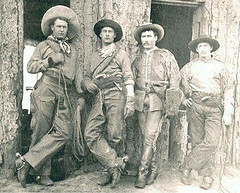 The hats, the guns, the horses and their Spurs. The history of Antique Cowboy Spurs goes back as far as ancient Rome and can be traced through history to their use in the American West. The use of the spur spread to other countries where it was modified and changed to reflect the change in style and use. You now have a chance to own a part of history. A pair of silvervintage western spurs can be yours to own. Imagine owning a pair of spurs that can be proved to have been in use in the American Civil War! Gilded antique spurs are the mark of a real cowboy or cowgirl and are a perfect collectors item if you are interested in Western American history. Many collectors of antique cowboy spurs, bit and tack are interested in items from certain areas or countries like Spanish or Mexican style spurs but often it is the history and the story of the Spur makers that is important. Look for classic items made by historic and famous makers such as Buermann or Crockett spurs which are sought after by collectors. Garcia spurs originating from Nevada are also popular. The Anchor stamp marked North and Judd spurs are highly collectible and will make a fine addition to your collection. Towards the end of the 20th century, Renalde Spurs owned both the Crockett and Kelly Spurs companies and was the largest producer of spurs in America. Vintage and Antique cowboy spurs come in a variety of sizes and designs. Used as a device to control their steeds, the spurs have become one of the most important items a Cowboy can own. The design of the spurs were often determined by the wearer and made to their personal style. Spurs are also slightly different in design depending on which part of the world they come from and what task they were made for. 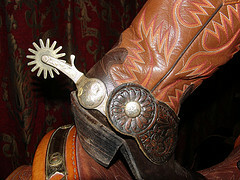 Also look back at the Cowboy Spurs section for more information and products.